On the morning commute to the office, while staring out the window and watching the scenery roll by, an image came into my head out of the blue, of the interior of a Druk Air Airbus making its approach to Paro Airport on a sunny day – and the following scene: little Yashvi is in the window seat on the left side of the plane. She looks out at the green hillsides, seemingly almost within grasp, as the plane threads through the valleys. In the middle seat next to her is her Mom, Ila, relaxed and with that flush of someone newly in love. And beside her in the aisle seat is Saajan. At first glance you would think he too is absorbed in the thrilling, sometimes hair-raising Himalayan views out the window. But if you watch him a bit more closely, you’ll observe he’s actually focused on Ila and Yashvi, and his normal reserve barely contains the smile of an average Joe who just won the Lotto. I think it says something about the impression a film leaves, when weeks later you suddenly find yourself fantasizing about its characters and what you imagine could become of them. The Lunchbox, Ritesh Batra’s beguiling debut, which was the darling of Cannes and TIFF and Telluride but managed to avoid running in the Oscar race (through absolutely no fault of its own), stayed with me long after each of the two times I saw it. From the first frame we’re plunged into the noisy, frenetic surges of people, vehicles and even pigeons moving around the overstuffed, sometimes shiny, sometimes crumbling, city of Bombay, but then it’s as if an unseen hand rises up, demanding us to “STOP!” and from thereon, we retreat mostly to the small apartment that the serious, determined young wife, Ila (Nimrat Kaur), inhabits with her oft-absent and roving husband and their pensive little daughter, Yashvi. When we’re not in Ila’s apartment, we’re following Mr. Fernandes (Irrfan Khan), a taciturn, soon-to-retire insurance company man, whose life is contained mainly within the box of his office, with its grid of row upon row of desks and piles of files everywhere, when he’s not commuting by packed train and bus to his silent, empty apartment. With the help of her neighbor, Mrs. Deshpande – whom we never see but whose shrill voice comes to embody a fourth member of the household – Ila is trying to recapture her husband’s attention by cooking him something really special for lunch. But, in an almost impossible fluke, the tiffin-box gets carried to Mr. Fernandes by mistake, and the restaurant-prepared lunch that he normally receives, goes instead to Ila’s man. This one-in-a-million mix-up is the catalyst for what becomes an epistolary romance between the two joyless and love-starved individuals. Batra’s Ila (he wrote and directed the film) is pretty, even without make-up and her hair pinned up, sweating over a pressure cooker, and she craves the regard and affection that her husband is clearly depositing elsewhere. Fernandes, bespectacled and greying, has lost his wife years before, and he too carries an emptiness with him. It’s then by way of short notes in the tiffin-box that goes back and forth each day that the two strangers slowly open up to each other, and share their observations about life, as well as their worries and disappointments. He begins to anticipate the mystery of what each day’s tiffin will contain, and she begins to relish the delivery each afternoon of the tower of empty metal bowls and the letters, allowing herself the brief luxury of a cup of tea as she sits and pours over each new installment. Irrfan Khan inhibits Saajan Fernandes fully, and he moves in a way that at times makes me think of the quirky Christopher Walken, just a beat or two off where you’d think he’ll be. So much is contained inside and barely hinted at on the exterior. Khan uses the smallest of gestures – the surreptitious glance around the office cafeteria before tucking into a letter, the use of the heel of his hand to push up his eyeglasses, a constant stiff posture – as brush strokes of how Mr. Fernandes is. 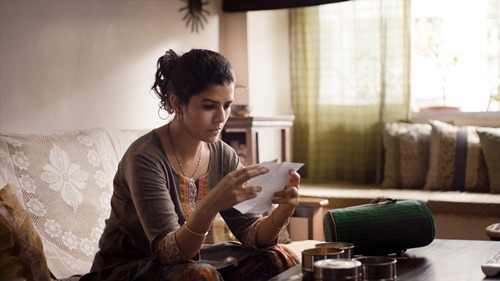 As Ila, Nimrat Kaur is wonderfully natural, owning the cramped space in that kitchen and all of the utensils therein as if she’d lived there for years as wife and mother, and when her character’s husband lets slip a seemingly innocuous lie about the lunch she sent him that day, just the tiniest, almost imperceptible, shift of her features reveals her reaction. And then there’s Nawazuddin Siddiqui. Of course, we recognize his body type, his height, the cleft in the chin – we know it’s him, Nawaz – the hottest thing in the Hindi film biz in the last year or two. But that guy disappears, and instead we’ve got this overly solicitous chamcha who makes us roll our eyes at first, but then grows on us like he does on Saajan. Beyond the very spare writing without a word wasted anywhere, and the talent of the actors, there are a ton of other small details in the film that I loved: the overlap in Saajan and Ila’s worlds, where a shot of a ceiling fan in her bedroom will cut to a shot of one in his office, the little boys on a commuter train screaming the song “Pardesi, pardesi” at top volume as they beg up and down the aisle, which then is playing on the radio when Ila’s husband arrives home (and if you watch carefully, that train car carries both Saajan and the unfaithful husband, separated by a few rows of seats), Saajan confessing to Ila in one letter that he “treated himself to an auto” on the way home, the same thing anyone who’s in or has come from a family where income was spent with great care and forethought will recognize immediately, and even Ritesh Batra having Saajan mention a painting of Bombay “with a stray dog gallantly crossing the street” which he bought. Those charming dogs, so ubiquitous throughout India, do indeed frequently trot about with a gallant air. When noting that neither of us were terribly tall, my mother used to add as a consolation “Good things come in small packages.” The Lunchbox is one such small package, which contains huge delights. See it, at least twice. You’ll appreciate even more details of what makes this film so lovely the second time around. This Friday, the film opens in NY (on two screens at the Angelika and also one at Lincoln Plaza) and in LA (at the Laemmle Royal). For next weekend, it opens on March 7 in DC, Chicago, San Francisco and other major cities. For a full list of the opening dates this month and next, go here.